It’s been a good week in the garden, graced, even momentarily, by a pair of bluebirds. I don’t know much about birds, but I believe that there are more birds in my garden now that I’m working with a garden designer and making a few changes around this place. Even later in the evening after seeing the bluebirds, I opened the back door just as a big hawk, maybe a Cooper’s hawk, landed in a nearby tree. “Oh, it is nice, but it looks like they are making a lot of changes in this garden. Of course, I am happy to let them stay for free, if they so choose. Did someone mention I should get mealyworms for them to eat? Coincidentally, these bluebirds showed up when I was outside with the garden designer and her partner, the "hort-abler". 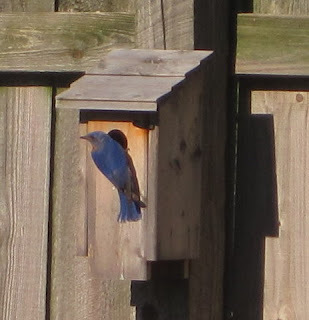 We admired the bluebirds for awhile, checked out the patio-in-progress and discussed the next steps in the garden as I continue with this mid-life crisis garden design process. 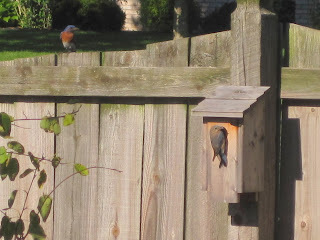 What fun it will be for you to have a bluebird pair nesting in your garden. I hope the Coop doesn't eat one of them. I can't wait to see what your patio looks like. Bluebirds of Happiness in your garden - how happy that makes us all. I wish we had bluebirds! We have lots of robins and swallows, but the birds I am busiest with these days are the chicks. These must be the bluebirds of happiness, Carol, and that can only mean that they are pleased with all the changes you are making to your garden. We have lots of birds here, but I've never been lucky enough to see a bluebird. Wow ! you are lucky to have bluebirds in your garden. They are beautiful. Great picture of the male blue bird checking out the new digs. Wonderful bluebirds! We see them here only occasionally, in the winter. It seems that they are attracted to water as much (or more) than mealworms. I'm sure they will love their newly designed environs! Now I know what a bluebird looks like! pretty birds! Any mid-life crisis that manifests itself in a new patio/garden design is good! Just no vanity plates. No bluebirds in my garden... So lovely to see yours!